Growing up No Doubt was one of my favorite bands! I had all the CD's because I was super fly like that. So when OPI announced they were collaborating with Gwen Stefani, I almost peed my pants with excitement. I said ALMOST people. As soon as they were available I ordered them all, because I need them all. So lets take a look. Beware this is a picture heavy post. Up first we have Push & Shove. I was really excited about Push & Shove which comes with a mini Lay Down the Base, basecoat. 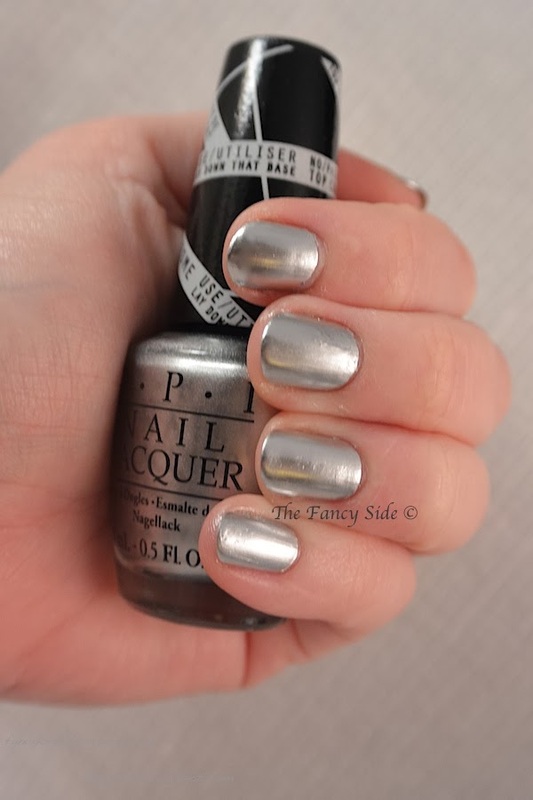 This polish is ridiculously shiny! 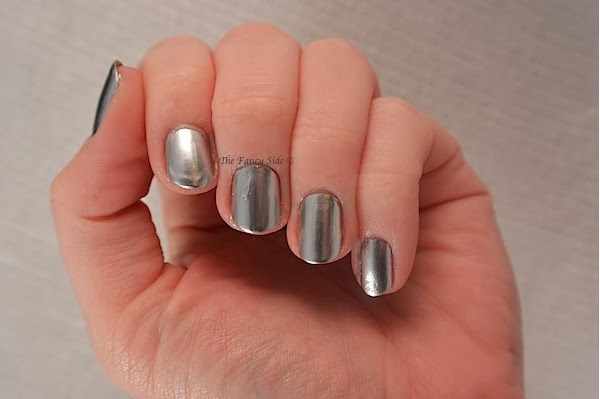 You aren't going to be checking your makeup on tiny fingernail mirrors, but it is the closest polish to straight up chrome I've ever seen. It does go on brushstreaky but as it dries it seems to disappear. Now we have I Sing in Color. This color reminds me of black cherry cola. 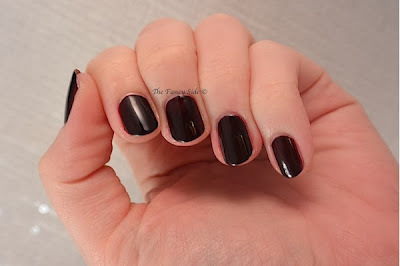 Its that deep vampy red that borders on black in certain lighting. This formula was flawless and covered in 2 easy coats. I know what you are thinking. "My gawd, another holographic glitter topper. Why do we care?" BUT GUYS!!!! 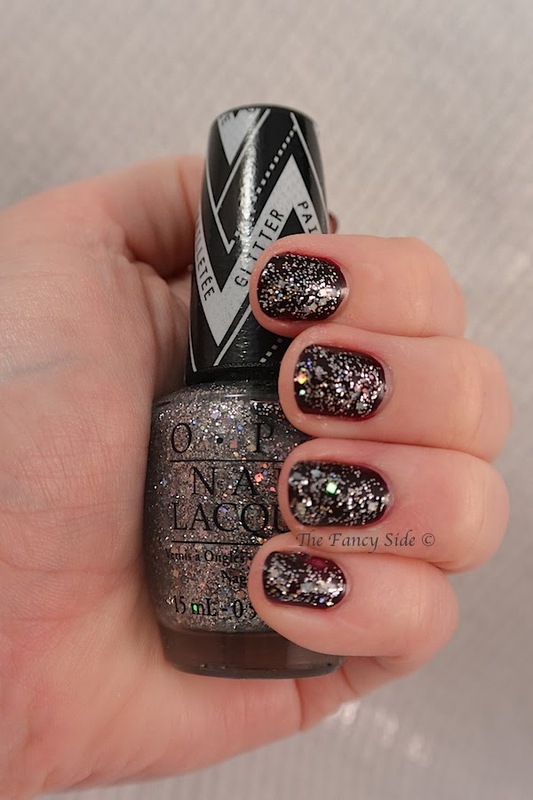 This one is unique, it has square SQUARE glitter in it. In True Stefani Fashion is unlike any other glitter topper I have. 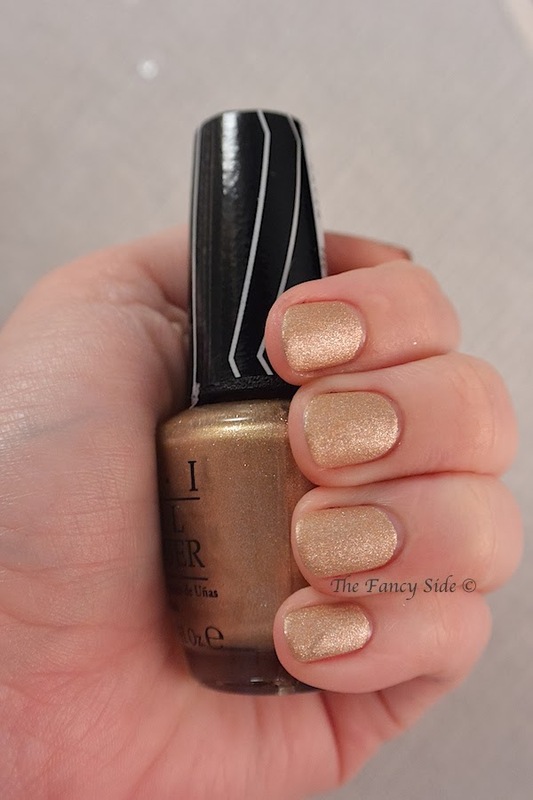 You are looking at 1 coat over I Sing in Color. There was no dabbing or glitter placing needed, it has great glitter payoff. 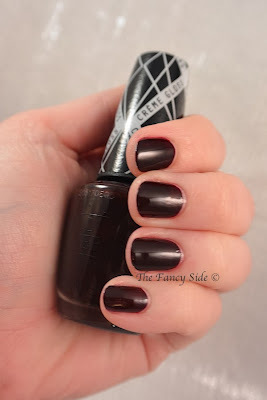 Over & Over A-Gwen, is a beautiful red creme. It's not an original color, per say. But the packaging will call to any who have a polish collector type mentality. 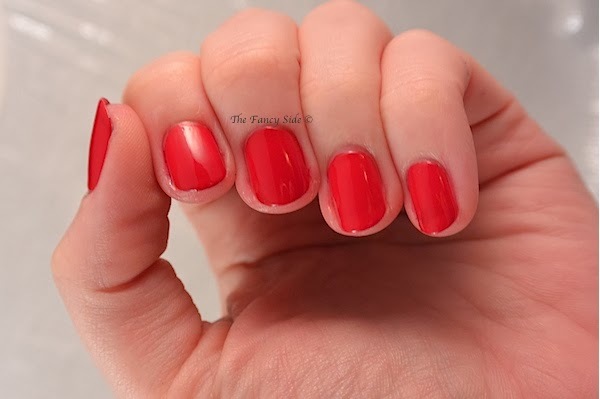 This is 3 coats that applied easily. 4 in the Morning is a surprise favorite for me. 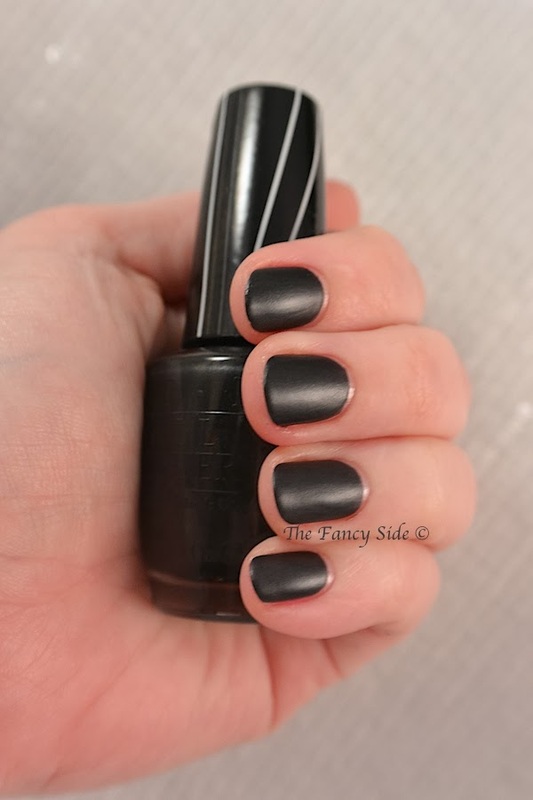 It's a satin finish black creme, but it isn't like a straight up plain black. 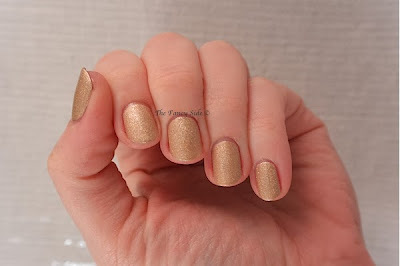 It has these tiny flecks of gold in the polish which gives it a really unique look. This is 2 easy coats. Love, Angel, Music, Baby is my favorite from this collection. It is the gold equivalent of this Gown Needs a Crown from the Miss Universe Trio. Want to talk about AMAZEBALLS? 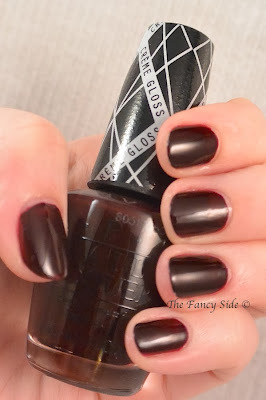 It's this polish. Love love love it. 2 easy coats and this dried to a satin beautiful finish. Finally we have Hey Baby. 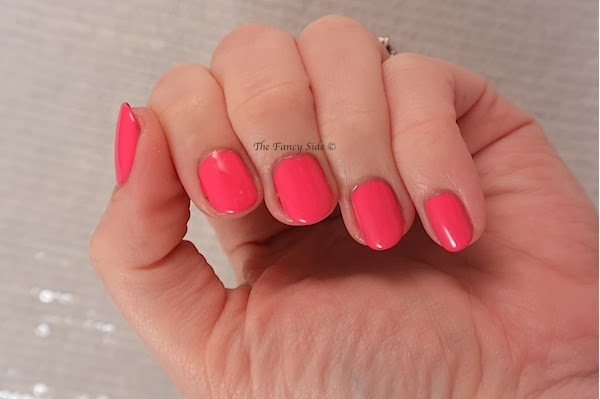 A bright pink creme, that is really nothing special, color wise, but it is a gorgeous pink. 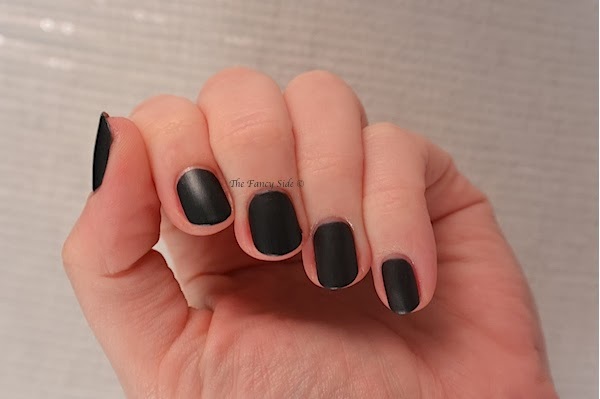 This is 2 easy coats. Now for a little fun! I've purchased this little pack of polishes! And I'm going to send it to one lucky blog reader! Yay!! Enter via the widget below. Good luck! I love love love "Hey Baby"
I got the gold one. 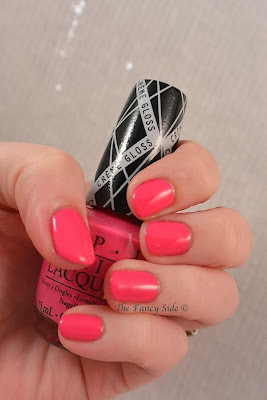 It reminds me so much of the Layla soft touch polishes! It's totally worth it. 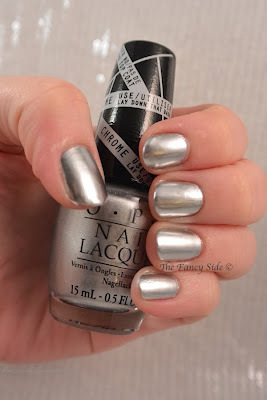 If you love the Silver from the Miss Universe trio, you'll love this one. It's the gold version. I like Push and Shove! L.A.M.B. is so lovely. I must own this polish. I love the 4 in the morning shade! That Chrome is beyond fly! It's one of few colors I'd just throw on and not feel like I have to do more. I love them all! I would probably use L.A.M.B. or 4 in the Morning first! Love, angel, music, baby is definitely my favourite! I Sing In Color is SO gorgeous! I love deep reds! It's an awesome one too. Good choice. Push and Shove is BEAUTIFUL! Love, Angel, Music, Baby is my fav! Ooooh 4 in the morning is killer! Must have for sure! Love, Angel, Music, Baby looks divine ! Hey Baby is actually my fave... even though you said it was nothing special! 4 in the Morning looks so unique! I love it! Love Angel Music Baby I think. I don't have anything like it and it looks so gorgeous! Love, Angel, Music, Baby is my favourite, for sure! Loving Push and Shove and 4 in the morning. This is a collection that I am really excited about. Thanks for the chance to win. I think I like the red Over and Over a Gwen the best. Almost, huh? I know the truth! All of these look great on you. I love Hey Baby! Beautiful! I am really liking Love, Angel, Music, Baby. You are the only one who has opted for the glitter. I like your style. Push & Shove is lovely. I haven't been able to find a good, non-streaky polish of that type! Love Gwen and was really excited about this too. Very classic and Gwen. 4 in the Morning is so amazing! I'm lovin' Push & Shove! I want Push & Shove so bad :P. As a woman married to a man who loves cars, I think I'm required to obtain it lol. I love Push & Shove! I love Love, Angel, Music, Baby! I'm super anxious to get these >.< Last weekend I was supposed to make a trip to my nail store (thats unfortunately about a 30 min drive away) but I couldn't make it so I'm hoping I can get my hands on these this weekend. Last night I even dreamt about these...all I remember is that I bought them at some place and at checkout I also purchased a slice of pizza for a dollar...it was like crappy frozen style pizza...then when I got home I realized I didn't get push & shove and I was all enraged and then I woke up...probably cause I was angry. That is a crazy dream. Hopefully you'll get them soon. I'm in love with 4 in the morning. It looks awesome! 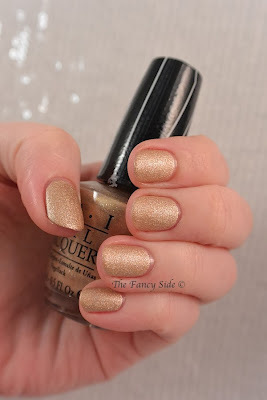 Push and shove is gorgeous!! My favorite is the holographic glitter topper, is amazing!! Oh they are all pretty but the one id reach for first is Love, Angel, Music, Baby. Thank you so much for the Give away and Good luck to all who enters to. Love, Angel, Music, Baby is absolute beauty! For some reason Hey Baby is my favorite, and I don't do pink! Definitely 4 in the morning! I'm addicted to gold polish. 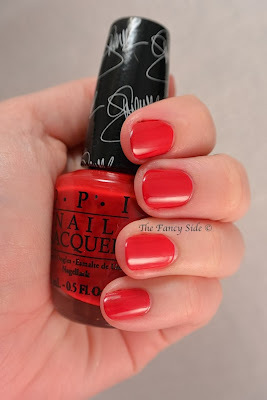 I love Love, Angel, Music, Baby - that's a different color than I have in my collection right now! I love the Love, Angel, Music, Baby. I like the Love, Angel, Music, Baby color. 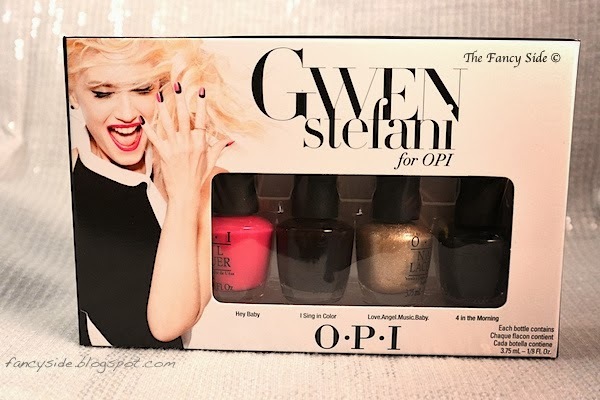 Ooooh all of the colors are SO pretty, but I especially adore Over and over A-Gwen! ;) such a fun name. Thanks! Calm down Gold Masta! I know which one is your favorite! The question was for others, not the people whose mind I can read...aka you! I like Push and Shove. Love, Angel, Music, Baby is my favorite! I love the I Sing In Color! Absolutely love it! I Sing In Color is gorgeous! Push and Shove! Bought it and LOVE IT! Love. Angel. Music. Baby is the best! Hey Baby is my favorite! 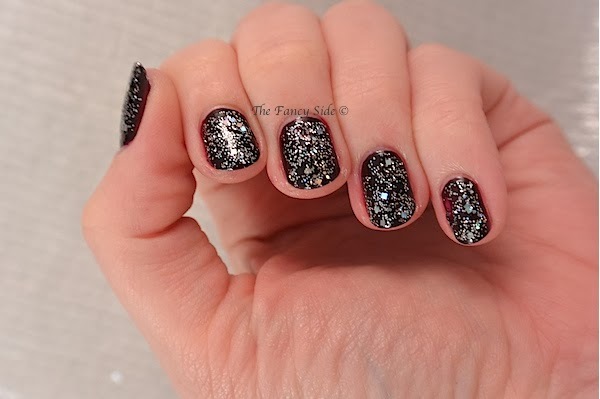 I love black with glitter. I love Push & Shove. Love. Angel. Music. Baby is my favorite. I love Push and Shove. I would love to try to stamp over that! hi! i love the glitter coat!!! I'm dying over Hey Baby! 4 in the Morning is amazing! Love, angel, music, baby!!! I love it! I really like Hey Baby! Would be perfect for this spring. It's a gourgeos OPI collection! I want it! My fave is Hey Baby. 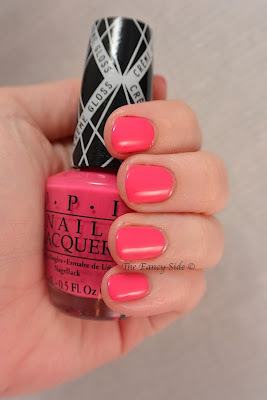 I’m a huge Gwen fan myself and am SO excited about her new OPI line! 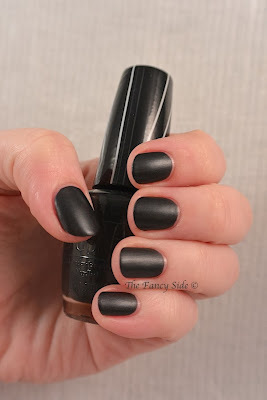 I love all the shades,especially Over & Over A-Gwen! Thanks for the giveaway! They are all pretty but I love Hey Baby the best. Love Push & Shove ! I really like Hey Baby!!! 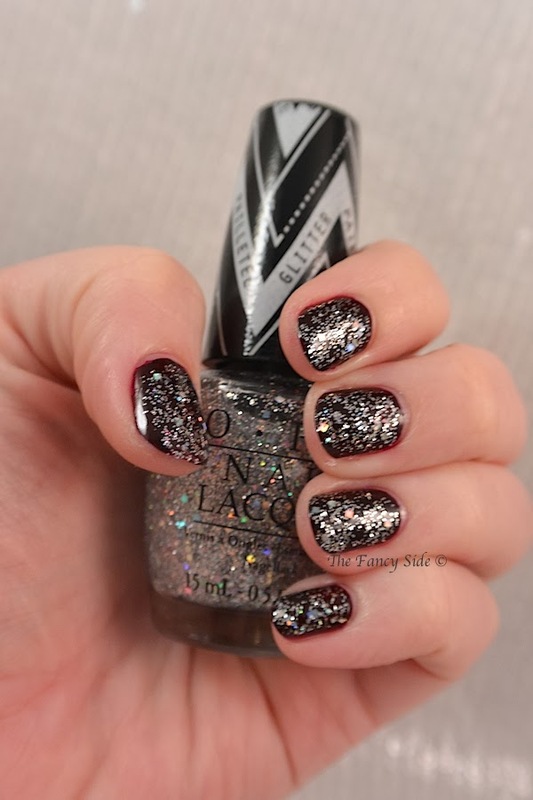 My favourite polish of this collection is Love, Angel, Music, Baby! I really love it! :) Thanks for this giveaway so great! I LOVE 4 in the morning!!! That is my fave and the one I want more than anything!!! Thanks for the giveaway and good luck to all. That may be the nicest thing anyone has ever said about my nails. Thank you for that. I love Over & Over A-Gwen! Push and Shove - I'm a lover of metallics. 4 in the Morning is really great!! Fingers crossed! I really like Love, Music Angel baby!!! I really like Push & Shove! I Sing in Color is my favorite polish. I like Push and Shove the best. Love, Angel, Music, Baby is my fav! thanks for the giveaway! 4 in the morning is my fav ~ Thank you for the giveaway!